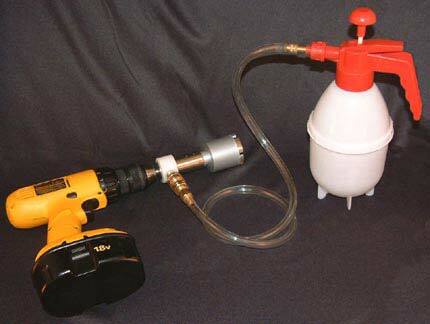 Diamond drill bits require water to lubricate and cool the drill bit. There are many ways to lubricate the drilling with water, as explained in our Drilling Tips & Techniques section. One of the most effective methods and the one used by most professionals is to use a Water Swivel, also know as a Water Feed Swivel or Water Feed System. 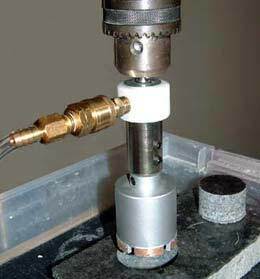 A Water Swivel Adapter injects water into the center hole of the drill bit shaft while it is drilling. The Swivel "feeds" water lubrication directly into the center of the bit, the water escapes around the tip and bubbles up around the outside of the hole. A Water Swivel Lubrication System forces water to the tip of the drill bit and also cools the inside and outside of the bit. Water Swivel mounted in drill press chuck. center of the bit shank. A Water Swivel is a very effective tool. However, there are many types of power drill mounts in addition to many types of drill bit mounts. It is very important to make sure that you get the correct Water Swivel to match with the specific power drill mount and drill bit mount that are being used. Additionally, the drill bit must have a water lubrication hole in the bit shank or mount, to allow the Water Swivel to pass water to the tip. The picture above shows a drill press with a standard drill chuck. The drill bit is a DiamondSure Pro-Sintered Diamond Drill Bit, which has a 10mm shaft. So, the Water Swivel device used above is the DX-902 Water Swivel which has a 3/8" shaft to mate with the drill chuck and a 10mm Collet to mate with the 10mm shaft on the drill bits. Many different Water Swivels are available below to meet the needs of most drilling situations. The water line used to provide water to the Swivel will vary depending upon each specific drilling application. A portable Water Feed Bottle, designed for use in temporary drilling applications, is also available in the Water Swivel accessories section of this page. Some water feed installations also add a small shutoff valve at the Swivel fitting connection, to allow the operator to adjust water flow while drilling. Many different types of valves are available at local hardware stores. The 3/8" Shank to 10mm Collet Water Swivel is designed to attach to a standard 3/8" or larger power drill chuck and mate with drill bits that have a 10mm shaft and a center lubrication hole. The DiamondSure Pro-Sintered Diamond Drill Bits all have 10mm shafts. The Water Feed Device has a triangular flat rounded 3/8" (10mm/0.39") shank to attach to a standard 3/8" or larger power drill chuck. The 10mm collet has dual Allen set screws to securely attach to a 10mm drill bit shaft. The drill bit shaft must have a center water feed lubrication hole. 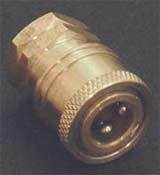 The Water Swivel has a Male 1/4" Quick-Connect fitting for attaching to a water source. The Swivel fitting is designed to connect to a standard Female Coupling 1/4" Quick-Connect fitting, which is available at most Tool and Hardware stores. A Female Coupling fitting is also available as an optional item in the Water Swivel Accessories section of this page. There are many different possibilities for connecting the Water Swivel to a water source.  The pipe, tubing or hose lines will vary depending upon each specific situation. A portable water bottle designed for use in temporary drilling applications and a shut-off valve are also available in the Water Swivel Accessories section at the bottom of this page. The 1/2" Shank to 1/2" Collet Water Swivel is designed attach to a standard 1/2" power drill chuck and mate with drill bits that have a 1/2" shaft and a center lubrication hole. The swivel's 1/2" Collet is designed to mate with a drill bit that has a 1/2" shaft and center lubrication hole as shown on the left. The Water Feed Device has a triangular flat rounded 1/2" (12.7mm) shank to mate with a standard 1/2" or larger power drill chuck. The Swivel also has dual Allen set screws on the 1/2" (12.7mm) collet to securely attach to a 1/2" drill bit shaft. The drill bit shaft must have a center lubrication hole. There are many different possibilities for connecting the Water Swivel to a water source. The pipe, tubing or hose lines will vary significantly depending upon each specific situation. A portable water bottle designed for use in temporary drilling applications is also available in the Water Swivel Accessories section at the bottom of this page. The 1/2" Shank (12mm) to G1/2"-14 Female Water Swivel is designed to attach to a standard 1/2" power drill chuck and mate with drill bits that have a G1/2"-14 threaded male drill bit mount and a center lubrication hole. 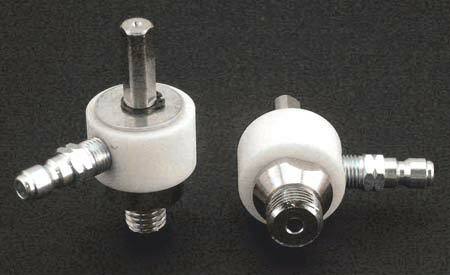 threaded mount as shown on the left. The Water Feed Device has a triangular flat rounded 1/2" (12mm) shank to mate with a standard 1/2" or larger power drill chuck. The 1/2" shank actually measures 12mm in diameter. Note: The 'G' in the G1/2" thread designation is indication of British Gas Pipe Thread, also known as BSPP for British Standard Pipe Parallel. The inside diameter of standard British 1/2" gas pipe is 1/2" and the outside diameter is 0.8250" (13/16"). It also uses the British "Whitworth" thread form, while standard US threads use a slightly different thread style, called the "Sellers" thread form. If the G-1/2" thread were translated into a US thread size, it would be very similar to a 13/16"-14 thread. The 1/2" Shank (12mm) to G1/2"-14 Male Water Swivel is designed to attach to a standard 1/2" power drill chuck and mate with drill bits that have a G1/2"-14 threaded female drill bit mount. Note: The 'G' in the G1/2" thread designation is indication of British Gas Pipe Thread, also known as BSPP for British Standard Pipe Parallel. The inside diameter of standard British 1/2" gas pipe is 1/2" and the outside diameter is 0.8250" (13/16"). It also uses the British "Whitworth" thread form, while standard US threads use a slightly different thread style, called the "Sellers" thread form. 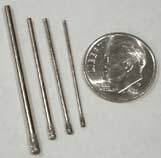 If the G-1/2" thread were translated into a US thread size, it would be similar to a 13/16"-14 thread. The 1/2" Shank (12mm) to 5/8"-11 Female Water Swivel is designed to attach to a standard 1/2" power drill chuck and mate with drill bits that have a 5/8"-11 threaded male drill bit mount and a center lubrication hole. 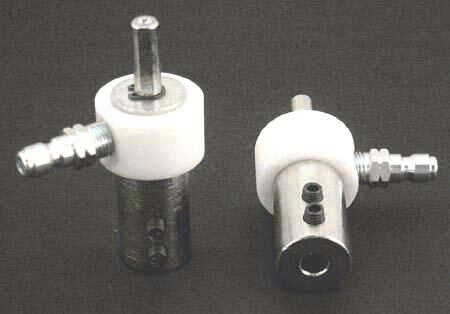 threaded mount as shown at left. The 1/2" Shank (12mm) to 5/8"-11 Male Water Swivel is designed to attach to a standard 1/2" power drill chuck and mate with drill bits that have a 5/8"-11 threaded female drill bit mount. The 5/8"-11 Female to 5/8"-11 Male Water Swivel is designed to attach to a 5/8"-11 male power drill mount and mate with a 5/8"-11 threaded female drill bit mount. The Swivel can also be "turned over", to attach to a 5/8"-11 female power drill drill mount and mate with a 5/8"-11 threaded male drill bit mount. 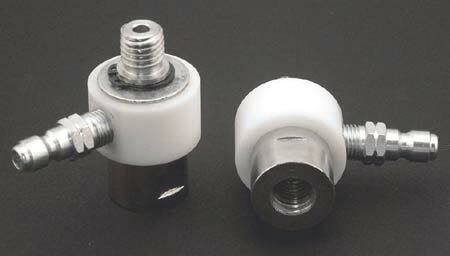 The Water Swivel has a Male 1/4" Quick-Connect fitting for attaching to a water source. The Swivel fitting is designed to connect to a standard Female Coupling 1/4" Quick-Connect fitting. A Female Coupling fitting is available at most Tool and Hardware stores or is available as an optional item in the Water Swivel Accessories section of this page. A portable water bottle is perfect for jobs where a direct water line is not reasonable. 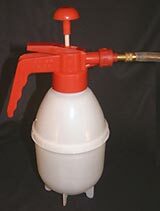 The 1-liter (34 oz) bottle has a pump to pressurize the bottle, a flow lever valve and a 3-1/2 ft. clear 5/16" diameter hose. The Water Swivels above, all come with a Male Quick-Connect fitting for attaching to a water source. The 5/16" hose of the Water Feed Bottle can be attached directly, over the Male Quick-Connect fitting, or a Female Quick-Connect fitting can be used with a 5/16" hose connector. Some portable installations also add a small shutoff valve to the Swivel fitting connection, to allow the operator to adjust water flow while drilling. ends of the Female 1/4"
Brass Female Coupler is a 1/4" Quick Connect fitting. The female coupler is designed to mate with the male Quick-Connect fitting on the Water Swivels, above. 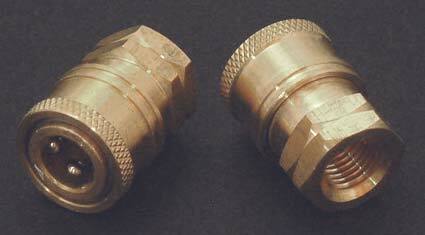 The threaded end of the coupling is Female 1/4" NPT which is US standard 1/4" pipe thread. A shut off valve is often added to the water line near the Swivel fitting connection, to allow the operator to easily adjust the water flow while drilling or to turn off the water flow as necessary. 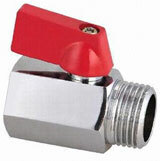 Shut off valve is a "full port ball" style valve which provides full water flow and easy adjustment. Full on/off is obtained with only 1/4 turn of the valve handle. 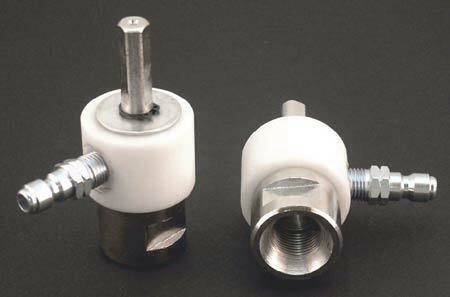 The valve has 1/4" NPT male and 1/4" NPT female threads. Valve is nickle plated and water flow can be in either direction.